The cover page of the report can be customized by point and click. You may change the title, client name, firm name, and firm logo. Click on "Add Logo" to upload a file in one if the following formats: JPG, GIF, PNG. To change a logo that you previously uploaded, click on the logo. To obtain a sharp and accurate display of your logo, both on screen and in print, select a high-resolution image (preferably more than 800 pixels long). Portfolio Lab will resize the image and optimize it for the report. The logo will be applied to all your portfolios. To move or resize the logo, place your mouse pointer over the logo to reveal the editor box. Then, use the drag bar to move or the corner handles to resize. When you set the client name for a portfolio, Portfolio Lab saves it and remembers it the next time you load this portfolio. 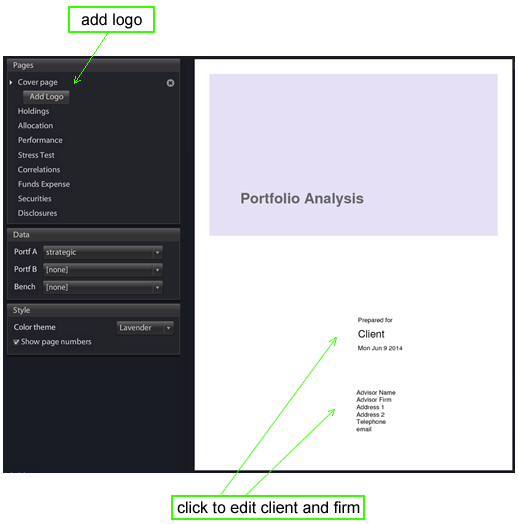 When you set your firm's name and information, Portfolio Lab applies it to all your portfolios.